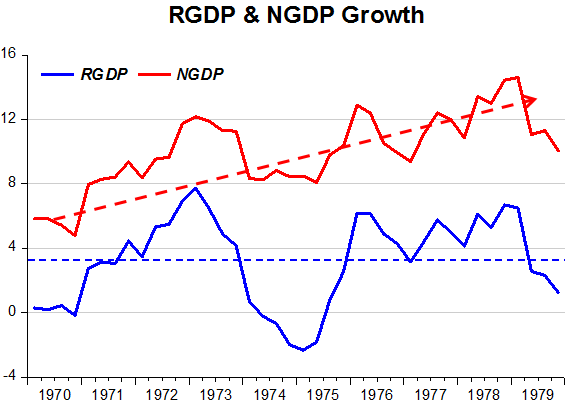 Debunking a cherished myth: The 1970´s was not the “stagflationary decade”. So the “stagflationary 1970s” is a big myth. That myth springs from the popular view that it was the rise in oil prices that caused the rise in inflation. Quite likely it was not so. 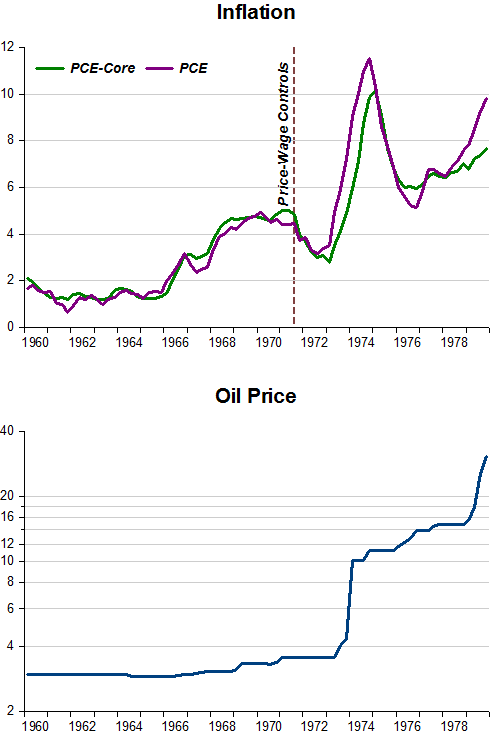 The chart shows that while inflation had picked up from the mid-1960s, oil prices were “stuck” at about $3 to $3.50 a barrel. Naturally, oil producers were a bit peeved about the reduction in their real incomes and decided to do something about it. In addition, as Scott claims, part of the steep rise in inflation was due to the undoing of price controls. But it was a supply shock anyway. And the economy reacted as indicated by a regular AS-AD model. The chart below shows that aggregate demand (AD) was on a rising trend over the decade, while real output growth averaged about 3.2% a year. 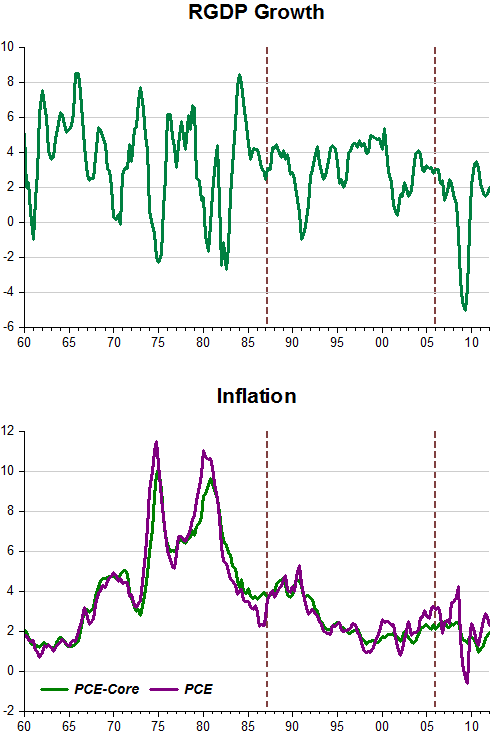 The fact that turned the 1970´s into the “inflation decade” was the systematic increase in nominal spending to compensate for the negative effects of the shocks on unemployment and RGDP growth. A longer term view brings out clearly what went on with real output growth and inflation during the different nominal spending growth “regimes”. 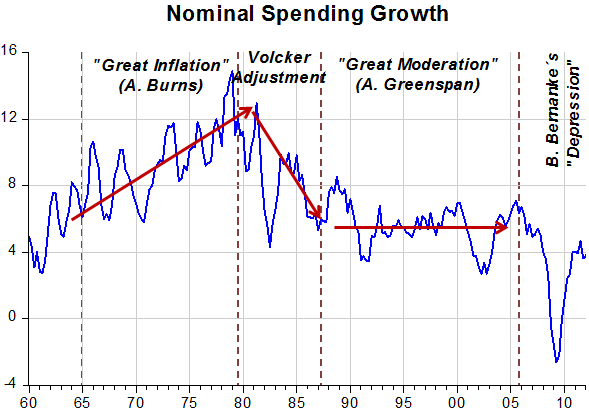 It clearly indicates the advantages of stabilizing nominal spending – or aggregate demand – growth along a defined level path. I’m more inclined to believe the inflation was due to many of us baby boomers using credit for the first time. In many cases, our parents hardly used credit at all and even built homes with cash. Becky – But surely in the 80s and 90s credit use was even higher. Nevertheless inflation came down strongly. It’s really interesting to think about the growing use of credit in the entire system. Certainly everyone learned to manage it through the Great Moderation. But you’re right, the growing use of credit is in part responsible for creditism thinking today. I’m glad I’m old enough to remember when life was possible without credit! Very good indeed. A big mith, True. Luis – The oil producing countries were the ‘fall guys’ for Burns´ incompetence. For most of that time real output evolved close to potential so that ‘cranking up’ the spending engine only resulted in higher inflation.